Livestreams, Nvidia, new games and more planned for Gamescom 2018. 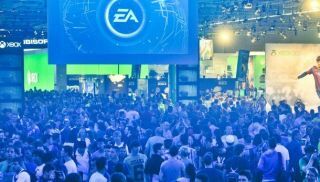 Gamescom 2018 kicks off on 21 August in Cologne, and concludes on Saturday 25 August. The event is traditionally never as reveal-heavy as E3 since it's primarily a consumer show, but you can expect news, trailers and more information about many of the biggest games revealed at E3. PC Gamer's Tom Senior and Samuel Roberts will both be there, reporting on the biggest games they can get their hands on, but in the meantime, here's what we know so far. Nvidia is hosting an event the day before Gamescom kicks off, on 20 August, which is called the GeForce Gaming Celebration. This is how it describes the whole thing: "The event will be loaded with new, exclusive, hands-on demos of the hottest upcoming games, stage presentations from the world’s biggest game developers, and some spectacular surprises." Last year, Nvidia's own Gamescom event revealed Final Fantasy 15 for PC, so there are likely to be some announcements of note. Our hardware news writer Paul Lilly optimistically hopes for next-gen GPU info. It'll be livestreamed, too, on Nvidia's Twitch channel, starting at 6PM CET / 9AM PT. Microsoft's Gamescom livestream in 2017 revealed the existence of Jurassic World: Evolution, but it also coincided with important details about the One X launch that's been and gone since then. Age of Empires 4 made a surprise debut, too. There will be a Microsoft livestream for Gamescom 2018, but it'll be an episode of Inside Xbox, which sounds less likely to be reveal-heavy. "Tune in on Tuesday, August 21, at 4:30 p.m. CEST (7:30 a.m. PDT) for lots of news, new Xbox One bundles and accessories, and features on upcoming titles that we can’t wait to tell you more about and perhaps even a few surprises!" So, hey, we might hear about some new Xbox controllers or something, but it's worth keeping expectations in check for larger reveals. EA, meanwhile, hasn't confirmed any livestream for Gamescom, but usually has one every year. Life Is Strange 2 will be revealed on 20 August, as per the above teaser (warning: it sadly contains emojis), and there'll probably be a few other game announcements from smaller publishers and developers, too. Don't expect lots of new blockbusters to be on the cards, however. Cyberpunk 2077 won't have a public booth this year, CDPR confirmed on Twitter, as reported by WCCFTech.